For a novice, the most efficient initial approach is to get a trainer kite and fly that for several hours before going near a power kite. The investment in a trainer kite will be the best kiting investment you make - particularly as you'll either be able to sell it to another learner at not much loss or will want to keep it for kids/friends to use. If you want to get a stunt or trainer kite, give me a call for some recommendations. Alternatively, if you book a lesson you can use one of my trainer kites for a few days before the lesson at no charge. Your first lesson with a power kite will be with MBK equipment - though if you have a suitable rig I'm happy to teach with that. This first lesson will include some body dragging - that is, flying the kite to deliver controlled power and drag you along the surface of the water. Having done this you'll either have decided that kiting is not for you or you'll be mighty excited and keen to go. If you're in the latter category, you'll want to fly a power kite and do plenty of body dragging. This is the best thing you can do before your next lesson. But this must be done safely...so don't do it without a lesson first. 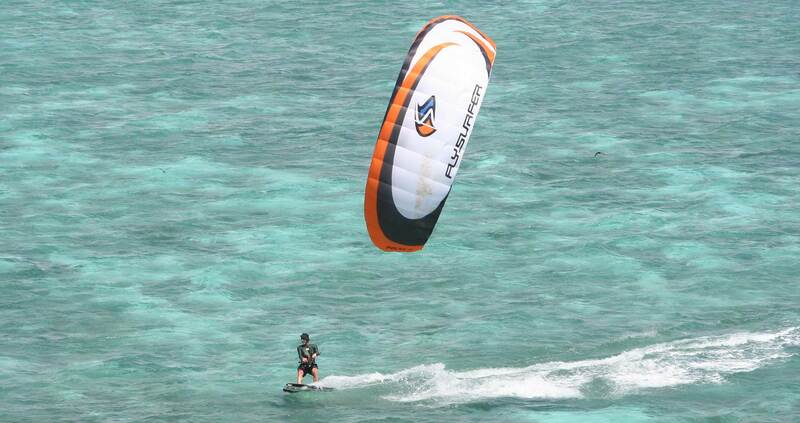 By the time you've had your first power kite lesson you should be safe to do some solo body dragging. I often arrange short group "clinics" before lessons. In these, I check rigging with students who may have had one or two lessons, we consider safety issues and, all being well, I then leave such students to do some private practice while I commence another lesson. Although some schools and retailers rent equipment, it's not practical for Moreton Bay Kiting to do this and is generally not very efficient for students. My recommendation is that after a first lesson students decide if they are committed to learning to kite and, if so, become members of SEQKA (South East Queensland Kiteboarding Association) & get some gear - at least a kite and harness. Consider this in relation to the possible lesson structures.